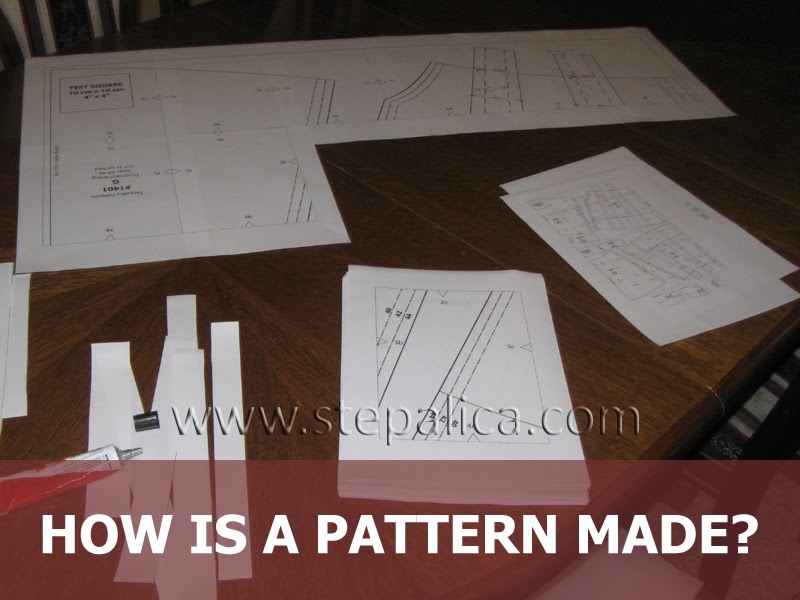 Have you ever wondered how the pattern is made? How does the pattern designer decide to make a commercial pattern for a certain model? To be honest, I didn't bother much about that before I started selling my own patterns. I did make some patterns before that, off course, I even made some of them in PDF format and put them here on the blog for download. However, I did all of that without a plan, depending on my liking and the time I had. When I drafted the Nougat dress pattern, I didn't have a clear image of how much time I would need to complete the pattern, nor of the amount of work it would require. I learnt a lot from my own mistakes about organization, planning, marketing, promotion, and some technical details like drawing the pattern and making it digital. Also, this gave me an insight of the work phases that were critical to me. This time, I tried to use all the experience to organize my time better and make an optimal working schedule. How do I decide which pattern to draft? An answer to this question can be rather complicated. I have a bunch of new ideas on my mind, I always look for an inspiration and think of the details I'd like to incorporate into a pattern. Sometimes I have a clear image of the final garment, but frequently I only have a draft concept without a vision of how the finished garment should look like. Besides the design, there are a lot of other technical things I need to think of and plan in advance: the season the garment is for, the right timing for publishing the pattern, the time I need to draft the pattern, make test models, convert the pattern to PDF, write the instructions for it, make all the illustrations, sew all the variations, organize the photo shoot, correct all the potential issues... These are all the phases that take a lot of time, and which I need to include into the planning. And don't forget I still have a day job, and only a limited time to work on the pattern. 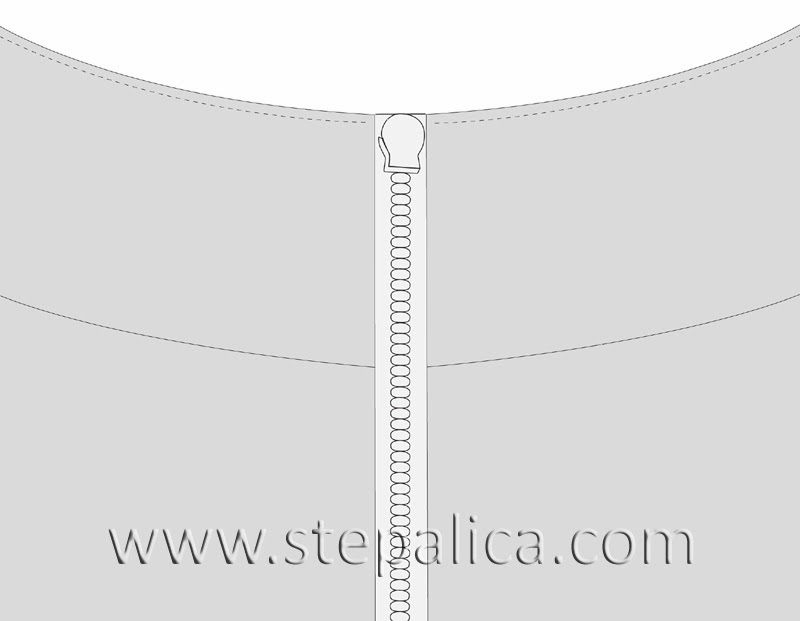 The Zlata skirt pattern was drafted last year. Initially I didn't plan to put the pattern on sale. However, my reader Mira from Belgrade, Serbia thought I was wrong. You see, Mira was the first to try out the pattern, as she won it in a giveaway I organized. 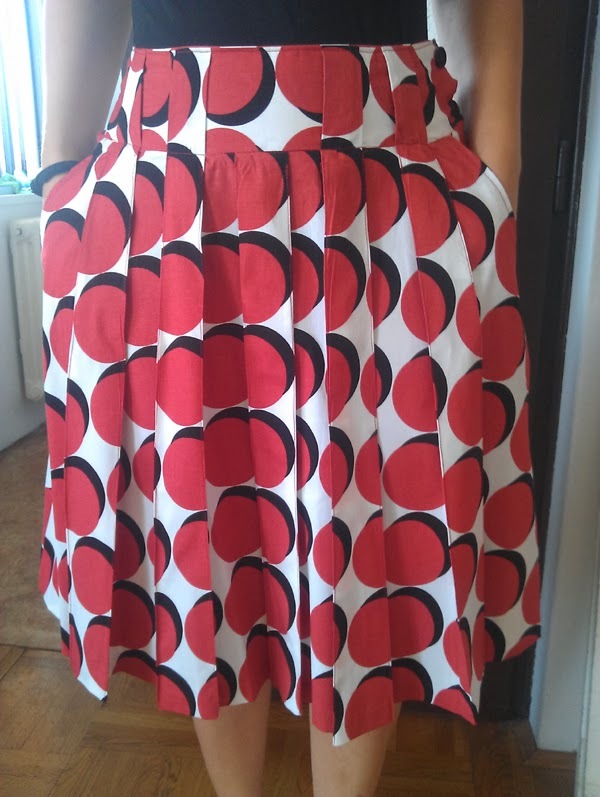 I was stunned when she sent me pics of the finished skirt only few days after. Look at it, isn't is gorgeous? What a coincidence, she even used the fabric I thought of buying at the time (actually, I used a fabric in the same print but different color scheme when I drafted the pattern). She said the model was lovely, feminine and figure flattering and suggested making a commercial pattern for it. Well thank you Mira, you have persuaded me! How is a pattern made? Once I choose the model I'd make the pattern for, I need to convert it to a digital format, scale it, write the sewing instructions, draw the illustrations and prepare the pattern for print. Most of the job I do myself, but I hire help for some of the stages. First I draft the paper pattern, mark and label all the pattern pieces and make sure all of them fit perfectly. Then I grade it, again - on a paper. I know some of the pattern designers perform this step on a computer, but I didn't dare to do that as I don't have a good sense of the actual measure when working on a computer. So, I opt to grade manually. After all the pieces are re-drawn, I make a pattern sheet that needs to be cut into smaller sheets appropriate for printing on a home printer, on either A4 or Letter paper format. This part of the work is rather simple, but quite boring and time consuming. I use the contours of the pattern pieces when drawing illustrations for the sewing instructions. This part of the job I partially do myself, but for some of the more complicated illustrations I hire professional graphic designers from the Muffin Studio. They also design the front and back covers of the pattern and prepare the sewing instructions for the print. I like working with these guys - they are very young, creative and have a great imagination. They are also willing to exchange ideas with me, give me some great suggestions and they inspire me in general. Along with this part of the job, I write the sewing instructions. I write them in English, and let Jelena do the proof reading. I think I have found the best person for the job - Jelena is an English teacher and a translator, but she is also a great seamstress. I wanted to hire someone who had an idea of what the pattern and the sewing instructions looked like, someone who would not only check my grammar and spelling, but also verify if the sewing instructions were meaningful and clear, and Jelena was that person. And do you know which part of the process I find the hardest to do? Writing pattern description and drawing illustrations! I spend most of the time working on those, all the rest goes smoothly and rather quickly. I usually design the pattern variations after the original version is made. I can envision the variations by looking at the initial model. I try to offer variations that are either quite different from the original, or that give additional styling options when it comes to fabrics, colors and prints. This time, I sewed the pattern variations along with the pattern testers who tried it out. When sewing the variations I try to use various fabrics in order to demonstrate the final effect each of them provides. This time I used denim, linen and a wool blend, therefore the fabrics that are used for different seasons and occasions (business or casual). The Zlata skirt pattern was tested by 27 testers from around the world. Their help, suggestions and comments helped me correcting the pattern and sewing instructions. All the sizes were tested on various body figures by seamstresses who had different sewing skills - from the beginner to expert. This gave me an insight of whether the pattern was drafted and graded well, and if the instructions were clear and detailed enough. The testers helped me match the labels I used in the text with the ones I used on the pattern panels. They also helped me convert the measurements from metric to inches and yards. They also pointed out to some of the process descriptions that weren't clear enough or were missing from the instructions document. I am really pleased with their feedback and the help they provided. Finally, I would like to announce I have scheduled the Zlata skirt sewalong for the beginning of March, starting on Monday, the 3rd. The picture below displays the calendar of the sewalong with the topics I'll cover, so save the dates! Haven't bought your copy of the Zlata skirt pattern? Buy it now! You are an inspiration AnaJan, thank you so much for this rather interesting post and insight into your creative procedures. I guess we all should thank Mira for pushing it forward, and now we all get to share in this lovely pattern. My daughter loved mine so much that she was asking for one her size. I told her I would save mine for when she is big enough to borrow it, She is 9 years old lol. Thanks Naan! Starting a business is never an easy and smooth job. You have to improvise a lot and sometimes do things harder way in order to afford having a production and making any profit. I wanted to share with you what it looks like having two jobs - it ain't easy, but it's manageable! And I'm glad I have inspired you, that was my intention. I'm yet to learn and improve my work, but I have a feeling I'm on a good track.